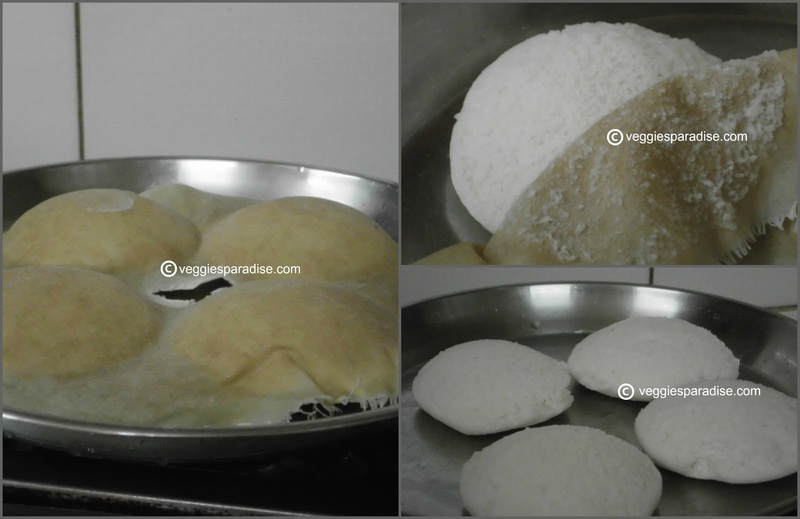 Idli - The most popular and common breakfast in South India, especially in Tamil Nadu. Even though we have lots of other breakfast recipes like Poori, Chapathi, Upma and so on...., nothing can beat the combination of Idli with sambar. Hope everyone agrees with me. :). Cooking time : 10 - 15 minutes. Wash and soak the rice in water . 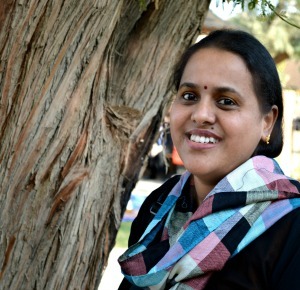 Wash and soak urad dal along with fenugreek in water. Soak them both for atleast 3 - 4 hours. Drain the water from urad dal (reserve the water for grinding ) .Using a wet grinder,grind urad dal by sprinkling water every few minutes until smooth and frothy. Transfer it to a bowl. Now grind the soaked rice adding water gradually, now pour this batter along with the urad dal batter. Add salt and mix the two batters well. Leave to ferment in a warm place for about 8 -10 hrs. 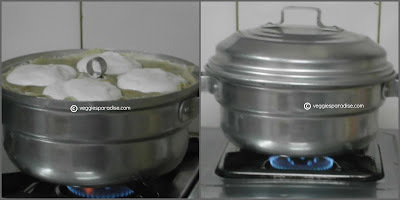 Add water in the idli vessel. Wet a cloth and place it on the idli mould.Pour a laddleful of batter on it and steam cook for 10 -15 mins. 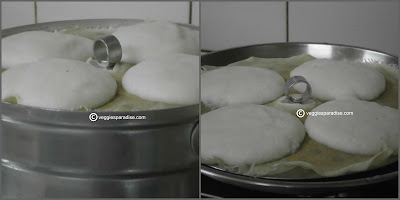 When the idli is ready , remove from the vessel and place the idli mould on to a plate. Our famous breakfast, love love idlis. Aruna, do you use Red matta rice for the parboiled rice or idly rice? I agree with the use of cloth. I find that when we use just matta rice, the batter tends to be sticky. Idlis indeed looks soft and yumm..I do in idli moulds in pressure cooker without the whistle.. Such soft melt in the mouth idli's. Thanks for sharing! All time favorite. Thanks for sharing these wonderful tips. 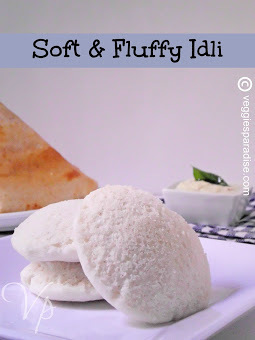 Idli looks so soft and fluffy..lovely post ! 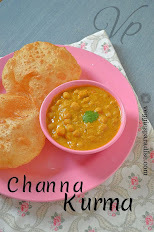 Looks tooooo spongy... Love to have it with Sambar ! Thanks for sharing the tips.. idli is my favourite..
love this!! Yours looks sooo soft! delicious luking idilis.well done n nice cliks. Idlis looks so soft.. Very useful post.. 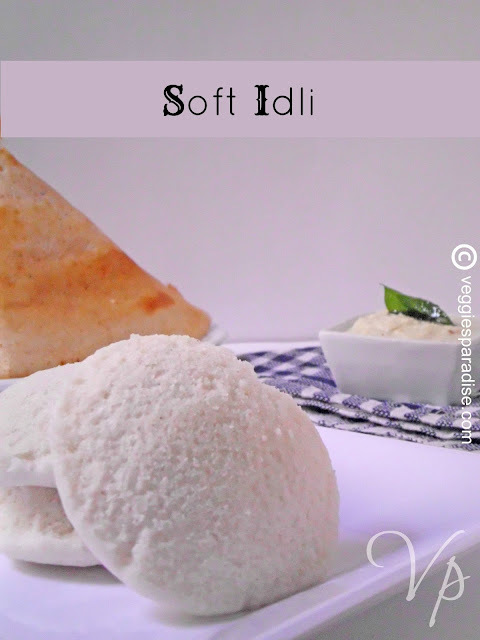 These look so soft, delicious idlis!